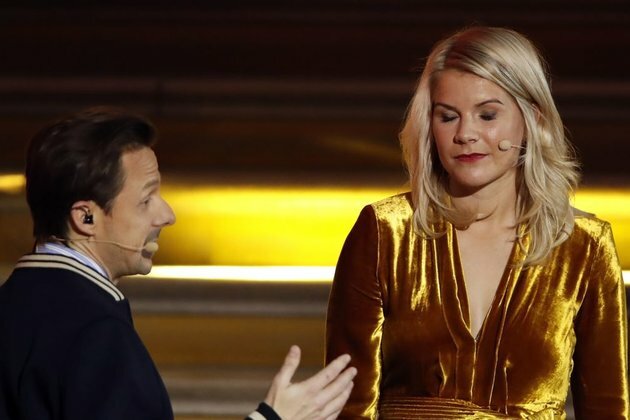 PARIS - French DJ Martin Solveig apologized and said he was taken aback by the stormy reaction online after he asked the inaugural women's Ballon D'Or winner Ada Hegerberg whether she could 'twerk' live on stage. The awards co-host in Paris provoked a torrent of complaints about sexism with his question about the sexually suggestive dance, which received a blunt 'No' from the unamused Norwegian striker. The incident was a major talking point despite Hegerberg's achievement in becoming the first winner of the women's Ballon D'Or, an award which has been handed to male footballers since 1956. Solveig, a musician and radio host, apologized in person to Hegerberg and said he was 'astonished' at the reaction. 'Guys I'm a little bit amazed, astonished by what I'm reading on the internet,' he said in a video posted on Twitter. 'What questions did they ask (Kylian) Mbappe and (Luka) Modric?' he posted on Instagram, referring to the winners of the best young player and the men's Ballon D'Or. 'I'd imagine something to do with football. Hegerberg, 23, whose goals propelled Lyon to a record fifth Champions League title and their 12th consecutive domestic crown, played down the controversy and said it hadn't marred her evening. 'I didn't feel it was like that at all to be honest and I am sad if people thought about the situation like that,' Hegerberg said after the show. Before the ceremony, Hegerberg told The Guardian that she found it 'really frustrating' that sport remains 'such a man's world'. 'Sometimes it's really frustrating, I must say. Sometimes you have episodes or situations where you feel like, damn, we're in such a man's world,' she said in an interview.